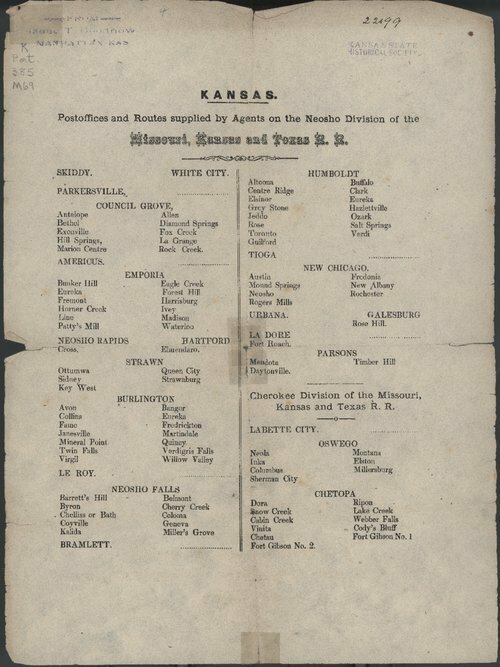 This is a listing of the major towns (post offices) along the Neosho and Cherokee Divisions of the Missouri, Kansas and Texas Railroad. Some of the towns included are Council Grove, Emporia, Neosho Rapids, Hartford, Strawn, Burlington, Neosho Falls, Bramlett, Humboldt, New Chicago, Parsons, Oswego and Chetopa. The routes related to each of these cities are also listed.